menak mi ban chem haskanum .. USA amen tary mi qani tasnyak milyon ognutyun te talis azerinerin .. isk sranq 4 bilyon dollar investment en XOSTANUM mexicoyin ? Just like that stupid joke about naming Yerevan when that idiot noah yelled YEREVAAAATS!!!. Yeah right, when his vartik/vorik yerevats. A joke to much of my disgust was publicly told by HH Garegin I. ** In addition to his nasreddin jokes. I should have killed Him then. WHAT AN IDIOT of a Catholicos??? Edited by Arpa, 16 January 2013 - 12:56 PM. rights, as it was placed without consent of the residents of the city. Mayor of Mexico City Miguel Angel Mancera said that the city government will relocate a life-size bronze statue of Azerbaijan's former president from the capital’s main avenue. 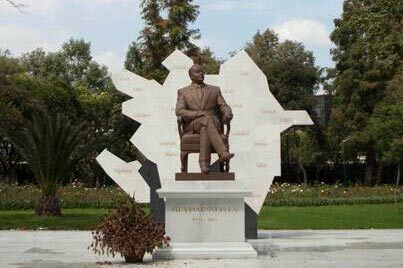 Russian news agency RIA Novosti quoted Mancera as saying that the new location of the statue of the late Azerbaijani President Heydar Aliyev will be determined later this week. The relocation costs will be paid from the city budget, he added. In November, an advisory commission issued a recommendation to remove the statue. The rights groups said they were offended by a monument of “dictator” erected in one of the busiest areas in the city. Azerbaijan has paid around $5 million for the renovation of part of Chapultepec Park, where the statue is currently sitting, and other public works. The protesters have objected Aliyev’s statue saying that he was an authoritarian figure, who led Azerbaijan first as Communist Party boss during Soviet times and then as president from 1993 until his death in 2003. Baku warned earlier of damage to Azerbaijan’s relations with Mexico if the statue is removed, including the potential cuts to Azerbaijani investments in Mexico. How about putting it in a public washroom, where everybody can piss on it. "alternate location" for the statue with the embassy of Azerbaijan. information on this man's questionable human rights record. Marcelo Ebrard, who had already signed the deal to refurbish the park. Cardenas, saying that this monument "does not honor Mexico City." PanARMENIAN.Net - A life-size bronze statue of Azerbaijan's former president Heydar Aliyev was removed from Mexico City’s main avenue to suburbs early Saturday, January 26 morning. Azerbaijan has paid around $5 million for the renovation of part of Chapultepec Park, where the statue is was installed, and other public works. Baku warned earlier of damage to Azerbaijan's relations with Mexico if the statue is removed, including the potential cuts to Azerbaijani investments in Mexico. MEXICO CITY — Statue of Azerbaijan’s ex-president Heydar Aliyev that has been erected along a main boulevard of the Mexican capital has been removed from the place in thAbout 400 riot police cordoned off the vicinity of Friendship Park on Paseo de la Reforma, Noticieros Televisa reported. The place where the bronze statue will be permanently relocated is still unknown. The monument was placed in a park the center of Mexico City last summer. Azerbaijani side reportedly spent about five millions for renovation of the park. Earlier mayor of Mexico City Miguel Angel Mancera stated that the municipality would cover the removal expenses. The official cause of the removal the city authorities say is the violation of construction norms. Mexico City’s municipality had set up a commission to consider the issue of removing the monument which aroused indignation of capital’s residents. The Commission recommended the government to transfer the monument to another place. In response Azerbaijan warned to stop investments in Mexico. appointed to study the monuments. Tolerance hosted an event commemorating Khojaly. early September, a couple of weeks after the statue's inauguration. human rights abuses and a muzzled press. statues of Gandhi and Winston Churchill. our national leader,' Mukhtarov told me. Joshua Kucera is a freelance writer based in Washington, D.C. In the Mexican state of Guerrero new conflict is brewing with government of Azerbaijan similar to the conflict concerning the monument of Heydar Aliyev in Mexico City, the Mexican news site Animal Politico reports. “According to documents the “Animal Politico” holds, the Guerrero Governor Angel Aguirre agreed to establish famous Azerbaijani poet Nizami Gyanjev’s monument in Acapulco,” the site reports. It says that it is stated in the letter signed by the Ambassador of Azerbaijan Ilgar Muhtarov on May 17, in 2012. Monument to Heydar Aliyev which was installed in one of the central parks of Mexico City in August 2012 was removed by the decision of the city authorities in late January. Azerbaijan has spent about $ 5 million on the reconstruction of two parks in Mexico City, after which it was allowed to install a monument there. Several protests were held in the capital of Mexico during which the participants claimed they did not want to see the statue of a dictator, who had ruled thousands of miles away from their country, next to the monuments of their heroes. As a result, a special commission was formed which recommended Mexico City to deinstall the statue of the former Azerbaijani President Heydar Aliyev, and noted that the government made a mistake by taking money and allowing a foreign government to decide to which political and historical figures should be rendered homage in Mexican capital. In mid-January, Foreign Minister of Mexico gave absolute freedom to the Government of Mexico City to make a decision concerning Aliyev’s controversial statue. The Azerbaijani Ambassador to Mexico Ilgar Mukhtarov said that the Embassy has decided to appeal to international organizations to get solution to the problem he even threatened to break relations with the countries. In mid-January the Legislative Assembly of Mexico City turned to the government of the city with an appeal to deinstall the statue. 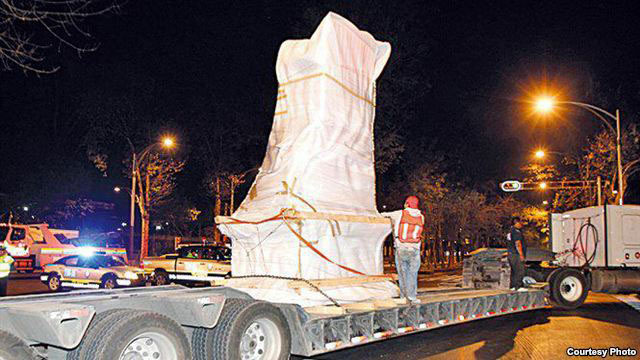 At the end of September 2012, in Canada, bust of Heydar Aliyev, installed a year ago, was dismantled too, as the authorities of the Niagara city considered it to be a statue of a dictator. Former President of Azerbaijan, “National leader” Heydar Aliyev is presented as an example of a modern dictator alongside with Saddam Hussein and Pinochet in the textbooks of “Constitutional Law” for the law students of Turkish universities. According to Azadlyg, photos have appeared in the social networks, where the pages of the textbook are clearly visible. There under the definition of autocrat the photo of Heydar Aliev is depicted who is also called a “dictator” just like Saddam Hussein and Pinochet. “During the dictatorship all the functions of the executive and judicial powers are in the hands of one person. Dictators, in contrast to the autocrats, do not inherit the power or get it in the result of elections, but they get it in a result of using the unstable and difficult condition that exists in the country. Dictators in the right wing may be known as the Nazis or National Socialists, and in the left wing may be known as communists. Today dictators can rely on a certain ideology. However, these individuals who control the power and sovereignty of the state form the controlling system, not compatible with humanity. Examples: Saddam Hussein, Heydar Aliyev, Pinochet…” the Turkish textbook says. Mexico City earlier this week. freedom of expression is tightly restricted. Ismayil Jabrayilov writes in an email. are recalling how the statues of Stalin, Lenin were brought down,"
see those scenes in Baku." Facebook page, recommended watching three times a day for good health. Aliyev's likeness is the centerpiece of an eponymous park. Mexico City mayor Marcelo Ebrard. angered by the fact that so much money is spent for these statues,"
100 students to study abroad instead of erecting this monument,"
NGOs have committed toward public space in the capital. Ebrard lauded Aliyev as a "great political leader, a statesman." Grupo de Cien, a union of artists and intellectuals, felt differently. Abraham Lincoln, Winston Churchill, and Mahatma Gandhi, was insulting. "We have enough bad symbols here in Mexico," he told the newspaper. "We don't need to import them from outside." dump: the Corleone family, of Godfather fame. The beginning of the end for Heydar Aliyev on the Paseo de la Reforma. with something related to a foreign enemy," she says. in reality, it lasted less than six months. or even close its embassy in the Mexican capital. negotiating with the city leadership of Mexico over the issue,"
Azerbaijani cultural center as a new, indoor home for the statue. down -- presumably one of lesser visibility. he has not yet received a request for reimbursement from Azerbaijan. who knows the truth about Azerbaijan at different stages of H.
publications, as he himself would like to use those thoughts. and will bring them prosperity. During the forthcoming visit of Serbian President Tomislav Nikolic in Baku, a visit which the Azerbaijani side considers as a “very important” one, an agreement is to be signed on “Friendship and Strategic Partnership,” the Azerbaijani Ambassador to Serbia Eldar Hasanov told Moderator.az. The ambassador also said that in honor to the Serbian-Azerbaijani friendship a monument to the famous Serbian inventor Nikola Tesla will be installed in Baku. As the Faktxeber.com reports, Azerbaijan also gave Serbia a loan of 308 million Euros, for a period of 25 years at 4% per annum for the construction of a road. The site also reminds that in 2011, in one of the parks in Belgrade a monument that was of three meters height was installed to the former Azerbaijani President Heydar Aliyev. At the opening ceremony of the monument was present also the current President Ilham Aliyev. Reconstruction of the park cost the Azerbaijani budget 2 million dollars. During the visit of Serbian President solemn opening ceremony of a park will be held where Nikola Tesla’s monument is to be installed. The head of the research center “Atlas” Elkhan Shahinoglu considers multimillion investments of Azerbaijan in Serbian economy in return for political support, inappropriate. According to him, Azerbaijan invests in the economy of countries which agree to install a monument to Heydar Aliyev. “This kind of exchange of monuments can cause problems in Serbia as well, just like it happened in Mexico where around $ 5 million was spent over the reconstruction of the park, but still, monument to Heydar Aliyev was removed. Who will return us the money, no one knows,” the expert said. the Bulgarian secret service agent was found dead. examination showed that he was killed. Recently it was reported that in the textbook of "Constitutional Law"
of a modern dictator in the same line with Saddam Hussein and Pinochet.